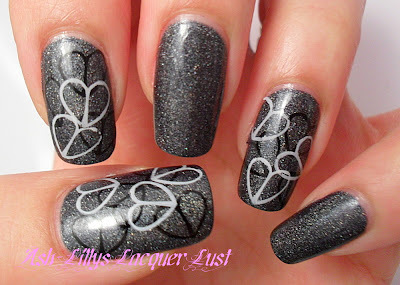 I've stamped on some hearts in black and white. I have a feeling that we'll be seeing a lot of hearts around here over the next few weeks, lol! This went on smoothly and I probably could've got away with two coats, but I always end up doing three. Thank you all and thanks Angeles, lol!